I’ve written numerous times about how I have the urge to buy every Lego set I see. I keep myself in check and usually end up only buying one new set every year. The problem is I also have this same addiction when it comes to Nerf guns. I want all of them. I’ve gone a couple of years since the last time I gave into my foam dart cravings, but I really don’t know how much longer I can hold out. 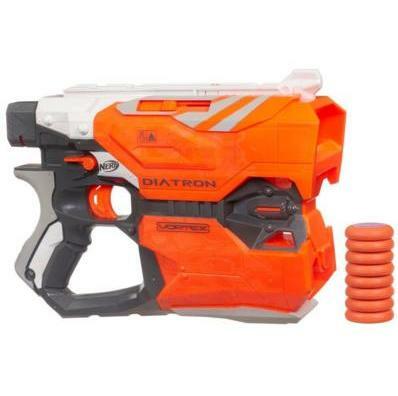 Two of the newest Nerf guns are showing up on store shelves now and they look fantastic. The Vortex Diatron was the first one that caught my eye. I haven’t bought any of the disc blasters so I’m always looking for an excuse. The thing that set this one apart is that it is able to fire two discs at once. The mechanism that separates the discs inside the gun make it impossible to only fire one disc at a time, but really why would you want to shoot one when you can shoot two? The strangest thing about the Diatron is it has the capacity for 10 darts and only comes with 8. I had managed to resist the Diatron’s siren call when I turned to the endcap and saw the Rough Cut 2X4. The crazy shotgun-like appearance is a big factor in Rough Cut’s appeal. It’s a cool looking gun. 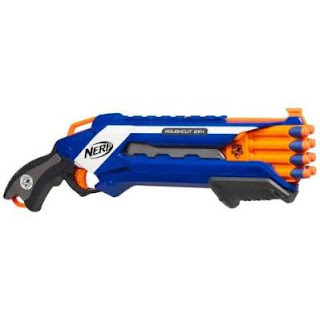 It comes with 8 darts and can fire single darts or two at a time. Sadly there isn’t an option to launch all 8 darts at once. The Rough Cut has what Nerf is calling slam fire, hold the trigger down and every time you pump the blaster two darts will fire. Both the Diatron and Rough Cut 2X4 are roughly twenty dollars.